How Does RA Usually Start? By admin , in Arthritis on April 14, 2019 . Variability is the key ingredient in the answer to this question. Most commonly, RA starts gradually, with pain and stiffness in one or more of the joints noted in below image. Usually, people first notice these symptoms in their hands. Early on, swelling may not be apparent, despite sensations of pain or stiffness. As the amount of pain slowly increases, however, swelling becomes obvious. Swelling in the joints usually appears within months of the onset of pain in the joints. Rarely, swelling does not appear until years after pain begins. For seven out of ten people with RA, the symptoms of arthritis appear in matching joints, on both sides of the body; this is called symmetrical arthritis. For example, the left and right wrists may both be affected or the left and right knees. In addition to feeling pain in the joints, people experiencing the early symptoms of RA may feel very fatigued, as though they were recovering from a cold or the flu. For some people, RA begins differently. These people may notice only increasing stiffness (particularly in the morning) without experiencing a great deal of pain. Others notice only progressively severe swelling, initially without pain. Still other people experience bouts of joint pain or swelling which appear suddenly and then disappear just as quickly. 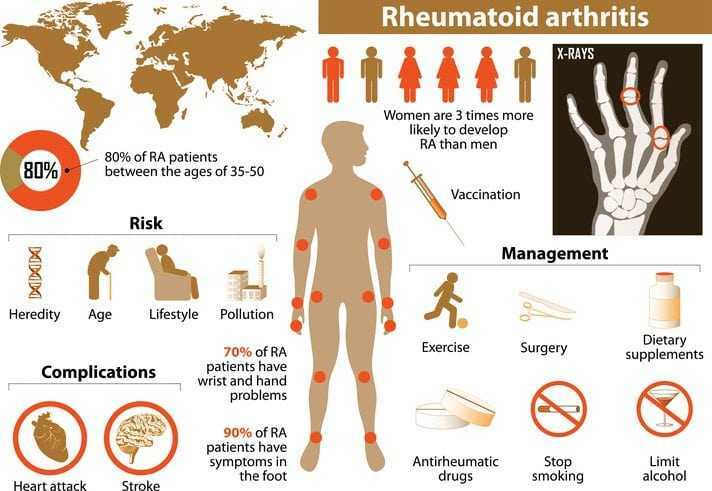 Someone who has these recurring attacks or flare-ups of arthritis which resolve quickly may be given a diagnosis of palindromic rheumatism before diagnostic evidence for RA develops. Less commonly, RA can begin with only one or two tender, swollen joints in an asymmetrical pattern, that is, the joints affected on one side of the body are different from the joints affected on the other side of the body. Since this is an unusual way for RA to begin, health care providers may be hesitant about confirming a diagnosis of RA based on these symptoms. In time, about half of the people whose joint pain begins in an asymmetrical pattern will develop the more typical symmetrical pattern of RA. RA sometimes begins as aching and stiff muscles, particularly in the shoulders and hips. This nonspecific aching may continue for weeks or months before the swelling of joints appears. Older individuals are more likely than younger people to have muscle aches and stiffness appear as the first sign of RA. Finally, RA may appear as rapid onset arthritis, with swelling and pain in many joints as well as such systemic symptoms as severe fatigue, low-grade fever, loss of appetite, and weight loss seemingly developing overnight.